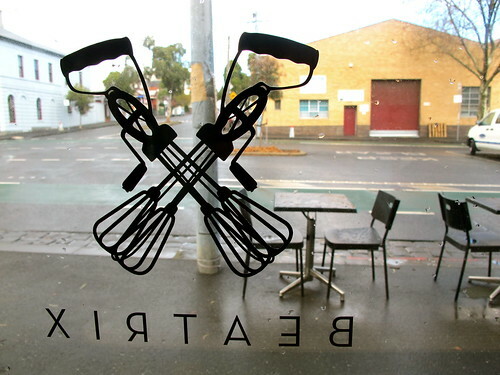 I'd heard good things and had been meaning to check out Beatrix ever since it opened at the start of the year. But it was my friend Matt, a fervent Beatrix devotee, who inspired me to lunch there the other weekend. 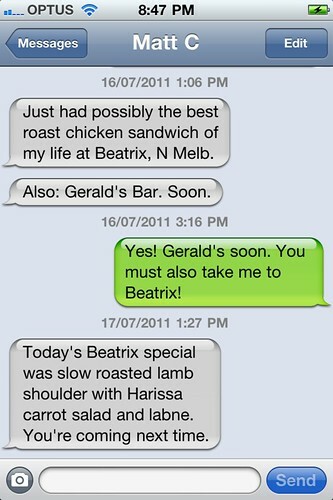 He'd visited Beatrix on consecutive days, SMSing me each time to rhapsodise about its sandwiches. Our texts to each other are almost invariably food-related. It's great. 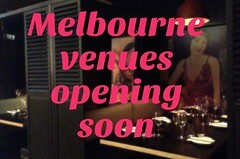 The cafe is tiny and tucked in a quiet corner of North Melbourne. 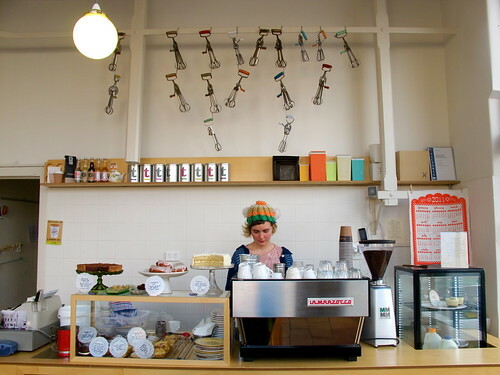 Inside, the cuteness is dialled up to Frankie levels, with a collection of vintage eggbeaters adorning the back wall and sweet, friendly staff serving up the Allpress coffee, Art of Tea teas and food. When you visit you may recognise one of the staff members as muso Evelyn 'Pikelet' Morris: when we had lunch there, a beardy young male customer was breathlessly fanboying her ("Oh yeah, I remember at that gig you were drumming with those guys. It was awesome!"). The savoury menu at Beatrix is very short, consisting of granola, a few toasties, a soup special and one or two ciabatta specials (check their Facebook page in advance for details of that week's specials). As Matt had promised, the ciabatta sandwiches were SERIOUSLY good. Right up there with EARL Canteen, Pope Joan, and the Auction Rooms knuckle sandwich. 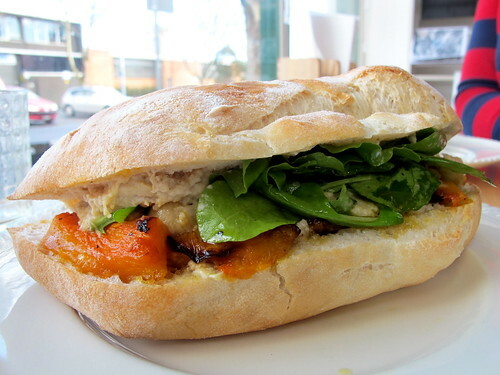 I ordered the St Brigid, the roasted chicken ciabatta that had so enraptured Matt. It came in two sizes, $12 and $10, and included fennel mustard mayonnaise and cos-slaw. 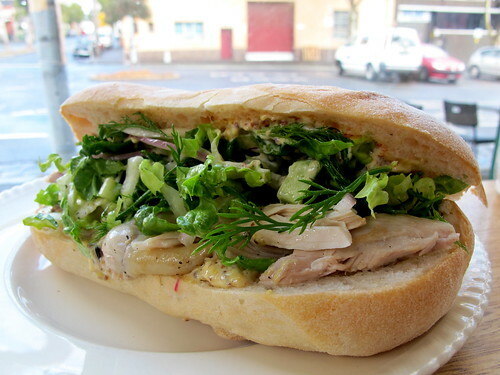 The free range chicken was succulent, the mustard mayo was perfectly balanced and the ciabatta roll (from Let’s-A-Loaf bakery, in Caroline Springs) was very fresh and neither too dense nor too chewy. A perfect sandwich. Matt and his lady friend S shared the St Brigid and The Phoenix ($9/$11), a vegetarian option which included sweet roasted pumpkin (the provenance of which was listed on the menu, but alas I cannot recall), smoky baba ghannouj and chopped chickpea salad. I had a small taste, and loved that the baba ghannouj was smoky but not so smoky as to smother the other ingredients. My one regret with my visit to Beatrix is that I didn't order a slice of cake to take away. 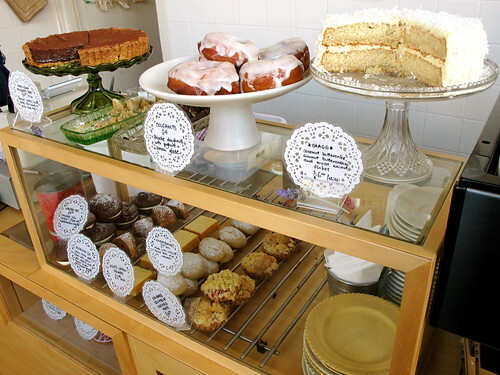 Owner Nat Paull, a much praised pastry chef and baker, keeps the counter filled with amazing-looking cakes that are the main focus of the business. What can I say?? I was stuffed full of sandwich and wasn't thinking straight. But just look at those lemon squares, and that coconut buttercake. Sigh. NEXT TIME, MY PRETTIES! Considering this place is LITERALLY on my corner, I go here often. Barely have to stumble ten steps from our back door to get some coffees and a piece of cake. The sandwiches are THE BEST aren't they? That bread is godly - the only ciabatta that hasn't completely shredded the inside of my mouth. I usually grab one to take away and eat it at home so I don't have to worry about looking like the piggy I am in front of other people. Hah. AND - the desserts - divine...Simple staples like the rugelach and the brownie - yuuuum. It took all my willpower not to buy one of the fresh raspberry marshmallows the other day. Such an awesome spot - glad they've put some seats up outside now too. 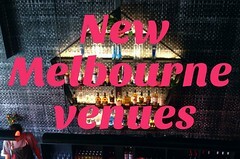 NORTH MELBOURNE FOREVER, ELSEWHERE NEVER! Wow... I can't decide if I want a sandwich or a cake more... might have to just visit and get both! I haven't heard much about Beatrix but have been curious for a while, so thanks for the great photos and review! Great post...how cute is this cafe! Would love to see you do a breakfast review of the Premises in Kensington. The star anise poached pears with polenta crumble is incredible. I used to travel to the other side of town to get a good breakfast but now I cannot imagine a better brunch spot!